I can hardly wait to get to Tanzania. The smells are so earthy. Dirt, compost, animals, vegetation. The sights are so contradictory. Women dressed so impeccably – a cow roaming the street. Rise and shine at 6:30am. Dressed, packed and ready to meet our driver. We arrived at the diocese at 7:30 and had breakfast. It was a beautiful place with a courtyard. I later learned that this is the Pope John Paul VI Memorial Hotel, a place that we would stay in the future. George Chobya, our driver arrived. He was friendly, kind and looked smart. He told us that he was 53 and that he had 7 children; 5 from his first marriage and 2 from his second. He was strong and adept at lifting our bags onto the top of the Land Rover where he tied the tools and equipment securely to the vehicle. We were on our way. Kampala to Tanzania – paved road and we went fast (50MPH perhaps)? Our team stopped at the equator where we did the touristy thing and took photos and used the WC. 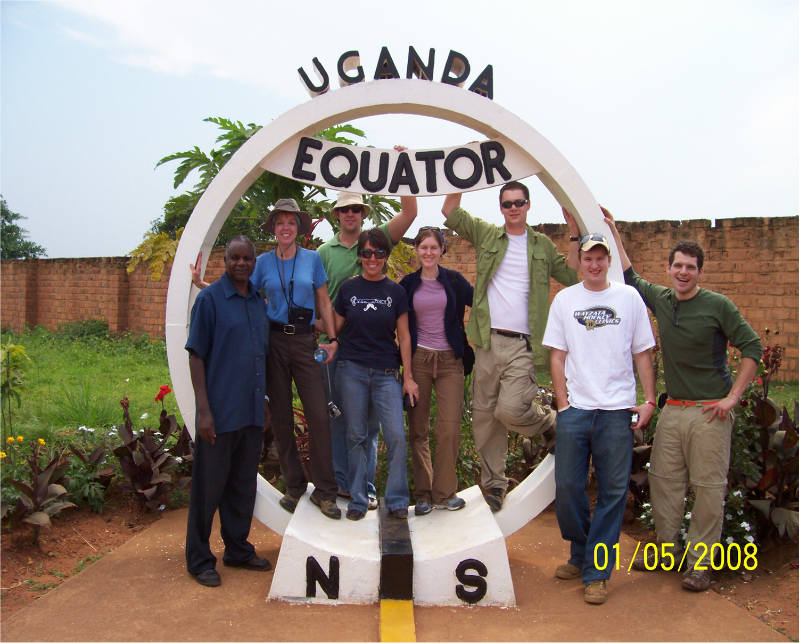 The photo of our team at the equator became one of my favorites. George then brought us to a restaurant and we had plaintain mash which I liked. A bit further on we traveled an extremely bumpy road. Not paved. George stopped, got out and released some air pressure from the tires to make the ride smoother. I’m sure it helped. Saw one monkey and a babboon about two feet tall. I so badly want to see the dramatic wildlife of Tanzania but know that the area we will be working, does not have many animals. We arrived in the late afternoon and met Edina, our hotel host. Edina looked young, vibrant, friendly, and no-nonsense. My room was Number 13 on the corner end in the ‘back’ of the Kayanga Hotel. Loved it! Ann was in the room adjacent to me and Kaye in the one next to her. The guys were in the front rooms, each with their own room. We were served coffee, sausages and tea. Then Ann led an evening reflection and most of us went to clean up. I slept under my mosquito net. Good night Africa. Embrace the tourist thing – the equator is fascinating.